All the crazy schedule changes stem from Dragon Boat Festival (Duanwu Jie 端午节) being celebrated this year on Wednesday, June 16th. The holiday is recognized as one of the official holidays for China. Dragon Boat Festival could also be called 'Double Fifth' as it's celebrated each year on the 5th day of the 5th month of the lunar calendar. We'll be celebrating by eating zongzi, dense rice dumplings wrapped in bamboo leaves. Both Kanyon and M'Lynn love these things, but only if they guess the right filling. 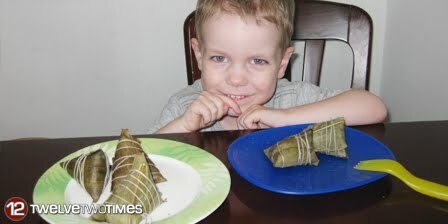 Zongzi can be filled with fruit, meat, eggs, or just about anything else. Other celebrations include drinking realgar wine and racing dragon boats. Dragon Boat Festival commemorates the life and death of the famous Chinese scholar Qu Yuan, who was a top adviser in the third century BC. He was exiled after a trumped up conspiracy charge. While in exile, he wrote many poems expressing his anger until 278 BC when he drowned himself in a river. Fishermen quickly rushed to the river trying to save Qu but were unsuccessful. Dragon Boat races remember this search. Once the locals learned that Qu was lost forever they began to throw sacrificial cooked rice into the river for their lost hero. People realized the rice was not reaching the bottom of the river so they began wrapping the rice in bamboo leaves to sink to the bottom and reach their hero. Other legends say fish were eating Qu's body. If the fish were not hungry, then they would not eat Qu. So local began throwing zongzi into the river to feed the fish.